Yesterday and today, I have been feeling extremely depressed. Then, several people reached out to me, which showed me how much I am loved. Their acts of kindness meant more to me than I can possibly express in words. First, I received a package from the mailman yesterday. My dad's girlfriend had sent me a book entitled "The Power of Simple Prayer" by Joyce Meyer. She also included a very special note explaining that this book had helped her through some tough times, and she wanted to send it to me for some emotional support. She told me that she and my dad think I am doing an outstanding job adjusting to the multitude of changes in my life. She even called me a special and caring person who has what it takes to 'stay the course'. If you could see the tears streaming down my face right now, you would know how much this act of love means to me! Then, today, the UPS man showed up at my door. Aunt J (the fabulous aunt whom I have mentioned many times before) sent me a box containing THREE containers of my favorite chip dip! This is Lawson's Chip Dip, and you can only get it at certain stores, which we, of course, do not have in this state. Again, this act of love - letting me know that she was thinking of me and that I mean enough to her to do this for me - well, it made me cry again (Gosh, I'm turning into such a mushy sap!). I got online and thanked her via instant messenger, and she told me that she sent enough so I could share, if I wanted to. Ummmm, yeah, of course I planned on sharing (*running to the fridge to hide the containers WAY in the back so no one knows where they are*). And, to top it off, I received an e-mail from PayPal telling me that a fellow blogging friend sent me a donation towards my camera fund. I couldn't believe my eyes. I'm not going to mention a name, because I don't want to put that very considerate person on the spot. I just wanted to express how much that meant to me, especially with the way I have been feeling emotionally. I am so blessed to have people who love me and some very special friends. I feel a bit guilty for feeling alone and sorry for myself these past few days. There have been some things said to me, which made me feel very inadequate and hurt. However, I should just take the time to realize the blessings of love and kindness that are shown to me, rather than focusing on the negative. Yes, I am spoiled. I am spoiled with so much love (sometimes more than I think I deserve). I only hope that I make my family and friends know how much I love them and how important they are to me. I pray for that every night. I learned a long time ago to not take people for granted, and I pray that I have never made anyone doubt what they mean to me. Isn't it great the way that just small, simple acts of kindness can make you feel so much better about life? Your dad's girlfriend sounds like quite the special person and so thoughtful, too! As for the chip dip, hide it in the very back and keep it all to yourself unless it makes you feel better by sharing! After all, each tasty mouthful will remind you that someone loves you and thinks the world of you while anyone else will just eat it because it tastes good! Here's to a very bright tomorrow for you!!! I'm so glad you feel loved...what a great reminder to reach out to those people we love too! May I just say, very gently, that you are special not only to those people who know you personally, but also to us who only `know' you through blogging. And we share your delight when things lift your spirit. God puts people and acts in our lives when he knows we need them and will appreciate them for their beauty and wonder the most. I remember when we first moved here, not being able to buy my favorite cheese dip depressed me more than anything. Now whenever I go visit my family, I stock up. You can never be more blessed than having wonderful loving caring family and friends in you life. 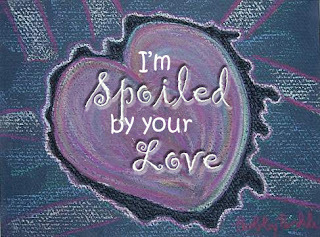 I don't think it's possible to be spoiled when it comes to love. It's like the Beatles sang, "And in the end, the love you take is equal to the love you make." There's a reason why your friends have been there for you. You must be pretty special yourself. Remember that and hang in there! I love care packages. They always pick me up. Happy to be your blogging friend! I think so highly of your writing skill and your friendship! We love you in the Nest! Yay for those tokens that seem to show up when we need them most.